In this paper we introduce a new framework for controlling compliance to discretionary access control policies [Cederquist et al. in Proceedings of the International Workshop on Policies for Distributed Systems and Networks (POLICY), 2005; Corin et al. 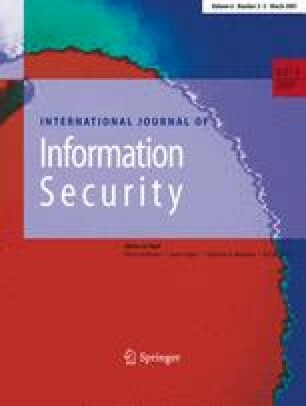 in Proceedings of the IFIP Workshop on Formal Aspects in Security and Trust (FAST), 2004]. The framework consists of a simple policy language, modeling ownership of data and administrative policies. Users can create documents, and authorize others to process the documents. To control compliance to the document policies, we define a formal audit procedure by which users may be audited and asked to justify that an action was in compliance with a policy. In this paper we focus on the implementation of our framework. We present a formal proof system, which was only informally described in earlier work. We derive an important tractability result (a cut-elimination theorem), and we use this result to implement a proof-finder, a key component in this framework. We argue that in a number of settings, such as collaborative work environments, where a small group of users create and manage document in a decentralized way, our framework is a more flexible approach for controlling the compliance to policies.